I have been a pet owner nearly all of my life -- a responsible one, too. Fortunately, none of my dogs and cats have ever gotten any diseases or anything that caused a premature ending of their lives. 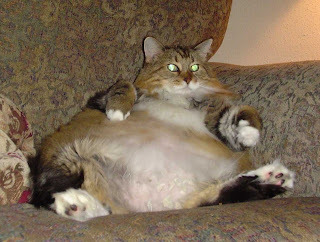 Nowadays, pets seem to be following a dangerous trend that humans (especially Americans) have been perfecting lately -- obesity. Animals are at their fattest ever. This is a serious problem. You can't just give your pet a treat everytime they ask for one. You're in charge. Enforce some discipline, or your cat or dog will wind up dead at a young age. (Live Science) American pets are facing an obesity epidemic, underscoring the belief that pets and pet owners tend to resemble one another. One-third of dogs in this country are overweight or obese, according to a study published in the April issue of American Journal of Veterinary Research. Previous studies found a third of cats are overweight or obese, too. Obesity is by far the most common condition that veterinarians see, said veterinarian and nutritionist Sean Delaney of Davis Veterinary Medical Consulting in California. And the widening waistlines of cats, dogs, rabbits and horses are a big problem that's just as unhealthy as obesity in humans. Overweight pets suffer from diabetes and joint diseases, and excess weight can lead to fatal illnesses. Similar to humans, the weight gain can be blamed partly on genes and the environment. But in the case of pets, veterinarians say, the sedentary lifestyle and fatty foods provided by humans is the main culprit.